The April challenge for the Island Batik Ambassador’s is to “Look Back” and get inspired! Not a problem for me. 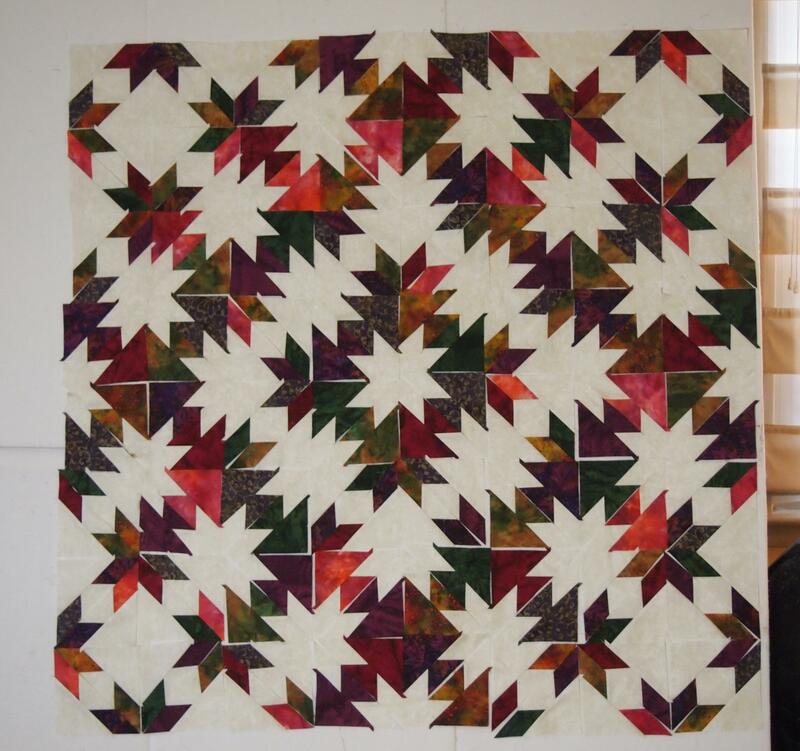 My inspiration stems from the Hunter Star quilt. 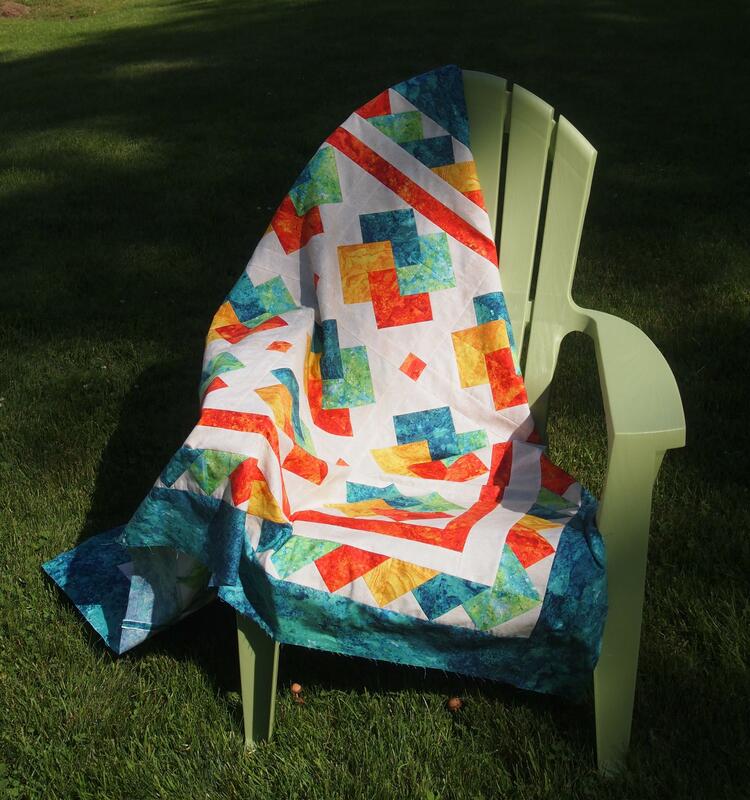 This quilt is on many quilter’s bucket lists. 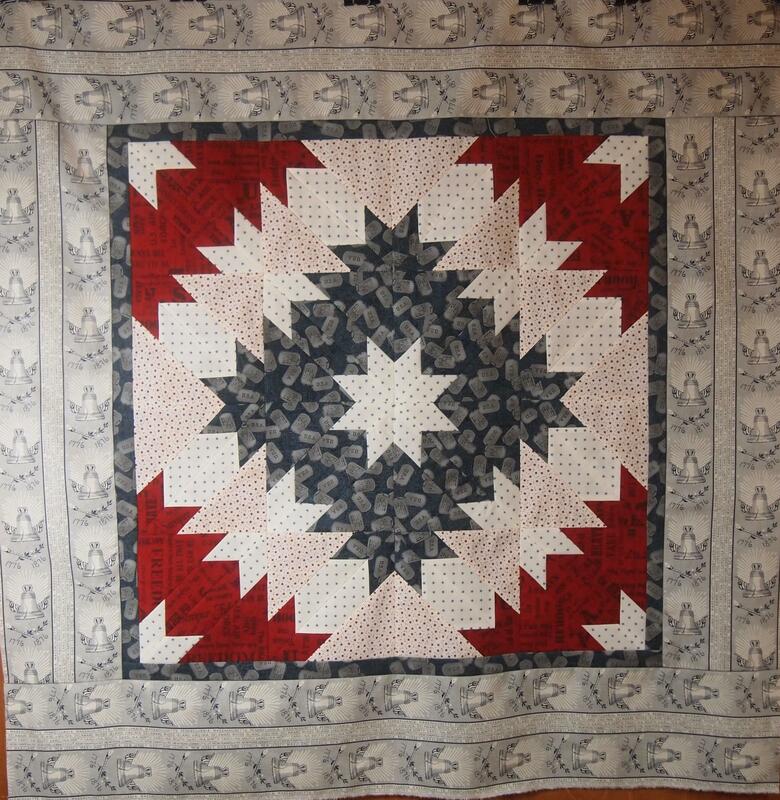 The quilt shown below represents a traditional hunter star layout. I love Deb Tucker’s Rapid Fire Hunter Star tools. 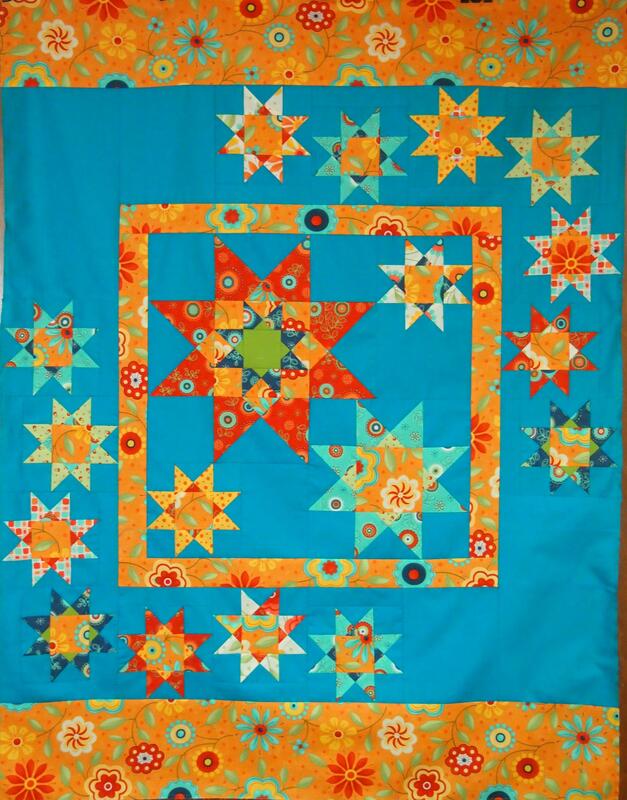 Once you learn the Rapid Fire Process you will be able to make any version of the Hunter Star Quilt. I went to Deb Tucker’s new book “Hunter Star Royal Treasures” for my inspiration. This book contains 40 different king & queen size hunter star layouts, including one from me “Waves of Joy”. But what got my attention were the “Alternative” layouts. Wow what a difference a little change can make. Instead of the traditional piecing of the dark trapezoid to the dark triangle or a light trapezoid to a light triangle, do the reverse and piece a dark trapezoid to a light triangle and vice versa. 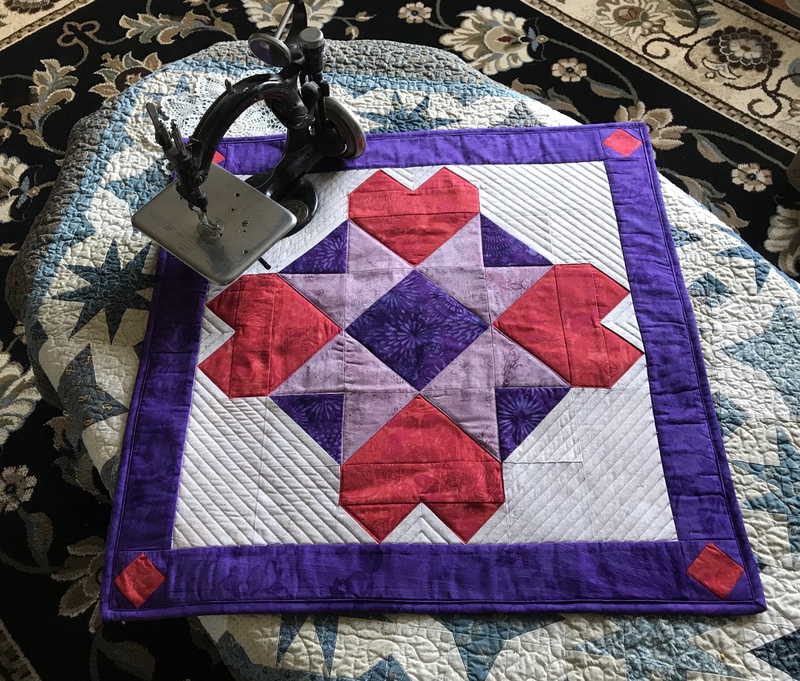 I wanted to make a smaller quilt, so I pulled out my Petite Hunter Star tool, and my Field Guide. This fabulous little book gave me the fabric requirements for a 5″ Hunter Star Petite, 8 by 10 block layout in a two color option. Sweeeet! 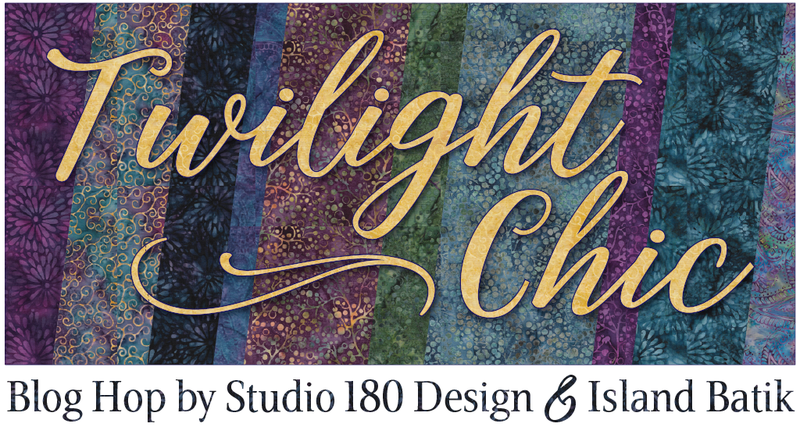 This book gives you yardage requirements and cutting instructions for 213 projects in 2, 3 & 4 color options for 5″, 6″ 7″ and 8″ block sizes from wall hanging to king size projects. I pulled my Crystal Cove Water Aqua & Cotton Egg-white Island Batik fabric choices from my stash. I start by cutting my triangle, star point & trapezoid strips in both colors. 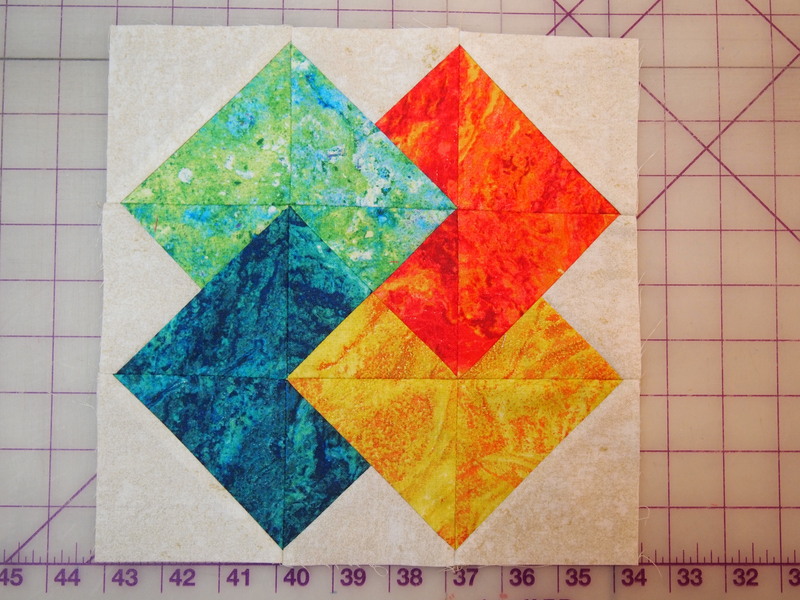 From my 5″ triangle strips I cut 5″ squares and cut them once diagonally and set them aside for later. As a righty, I lay my trapezoid strip horizontally on my cutting mat with the selvedges to the left. (Left handed cutting options are included in the tool instructions.) The strip can be either right or wrong sides together. 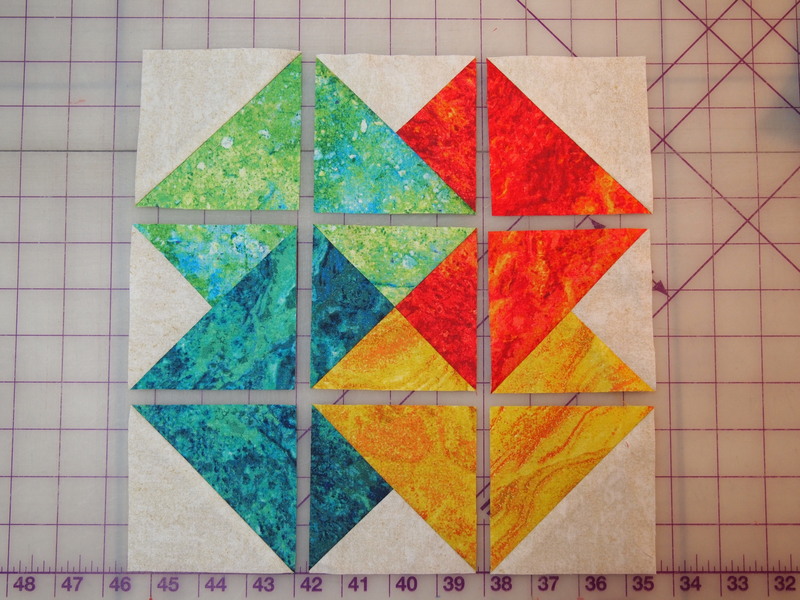 I’m making 5″ finished blocks so I place the 5″ line on my hunter star tool on the bottom of the strip and begin cutting my trapezoids for both colors. I cut my star point strips in half and divide them into 4 piles. The two aqua piles will be the star points on both ends of the light trapezoids and the two light piles will be the star points on both ends of the aqua trapezoids. 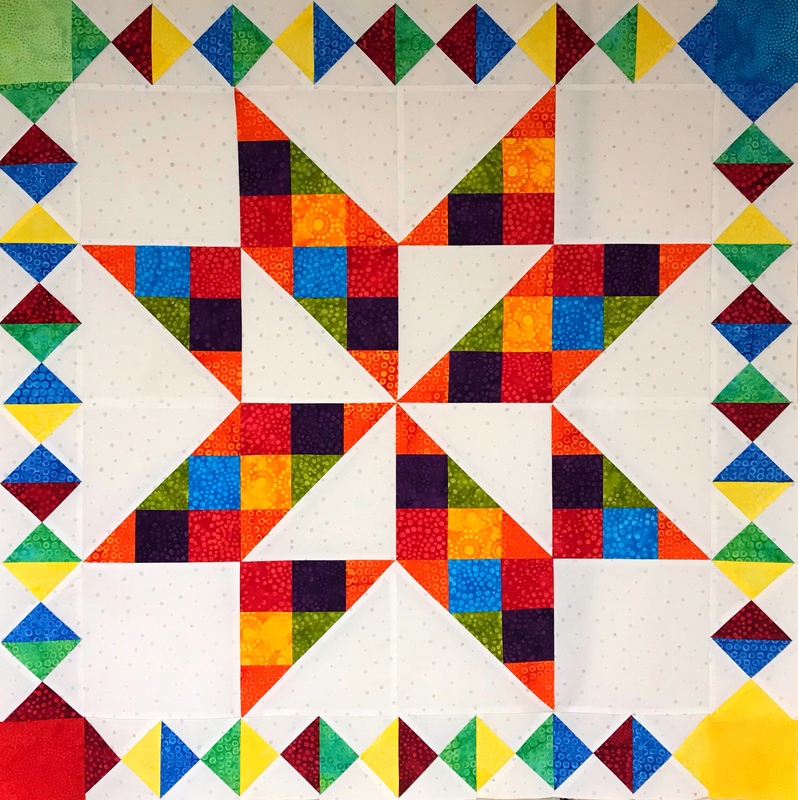 Begin by positioning the trapezoids right sides together with the star point strip, staggering down from the top 2 1/4″, spacing the trapezoids about 1/4″ apart and stitch. The hunter star tool instructions give detailed guidance. Once the trapezoids are stitched to the star point strip, place the strip set on the ironing board with star strip on the bottom and the trapezoids on top and carefully press as shown. Lay the strip vertically on the cutting mat and trim using the Hunter Star tool. Lay the strip horizontally on the cutting mat and trim according to the instructions. Repeat this process for both colors. The light and the aqua trapezoids have oversized star points on each end. One of Deb Tucker’s great tips is to lay about 5 strips of painter’s tape layered on top of each other on your cutting mat. Trim off a little on one side evening up the edges. Peel up the tape and place it on ruler line to aid in making repetitive cuts. Our trapezoids were precision cut from 1 3/4″ strips. By placing the built up tape edge on the 1 3/4″ line it will make it much easier to trim the sewn units to 1 3/4″. Trim all the units. Each hunter star block contains 2 triangles, 2 trapezoids & 4 star points. Remember, we are breaking the rules by centering and stitching a light trapezoid to a dark triangle & a dark trapezoid to a light triangle. Match the triangle halves, nest the seams and stitch. Press the diagonal seam open. Carefully align the center line of the tool with the center seam of the block. Carefully aligning the diamonds on the tool with the seam lines of the diamonds on the pieced block, trim up the right side and across the top. Lift the tool and rotate the block and carefully trim the other two sides, using the dashed lines along the side of the tool on the previously trimmed edges. Trim all the blocks to the cut size. Layout the blocks and stitch them together into rows. I added 5″ borders. 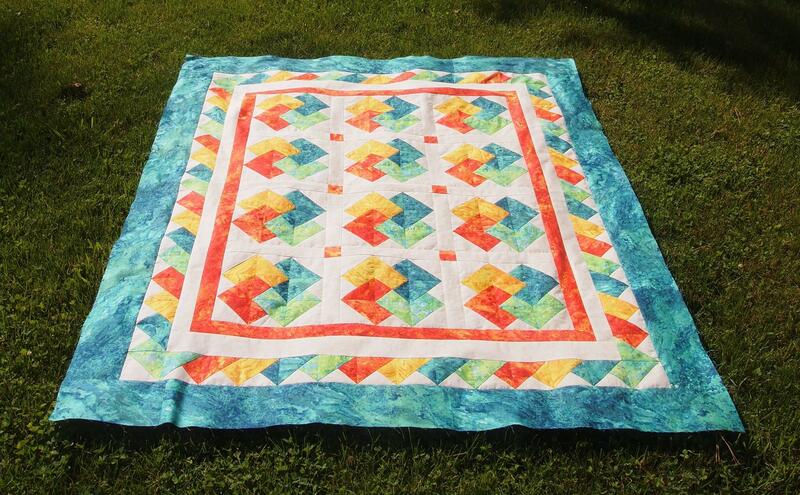 This is definitely NOT your grandmother’s Hunter Star Quilt! 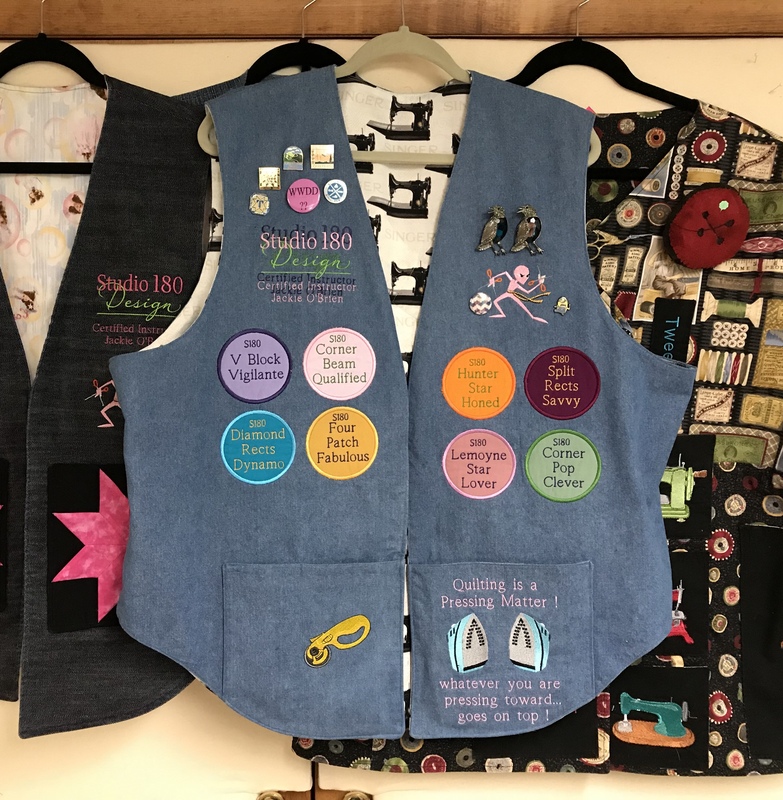 This entry was posted in Hunter Star, Island Batik Ambassador, Royal Treasures and tagged Deb Tucker, Hunter Star, Hunter Star Petite, Hunter Star Petite Field Guide, Island Batik, Island Batik Ambassador, quilting, Quilts, Studio 180 Design on March 31, 2018 by ifthesethreadscouldtalk. I just finished my class sample for the Hunter Star class I’m teaching in January. 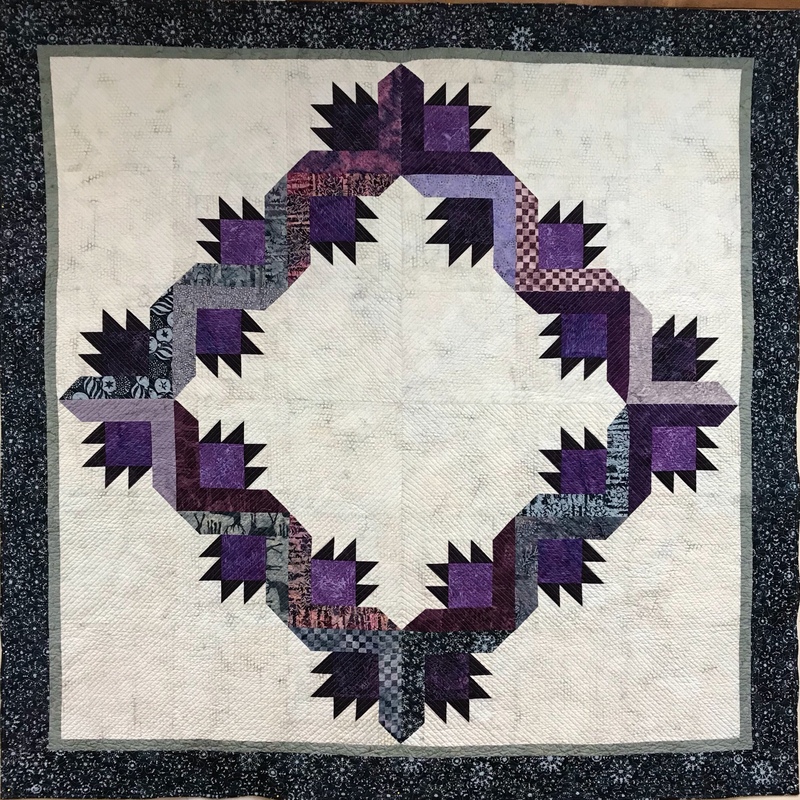 The pattern is called “SueNami” created by Sue Tucker. Her SueNami won the Blue Ribbon, Viewer’s Choice, and Best Adult Beginner at the 2009 Vermont Quilt Festival. This is a companion pattern for the Studio 180 Design’s Rapid Fire Hunter Star Petite, Wing Clipper I, and Tucker Trimmer I tools. 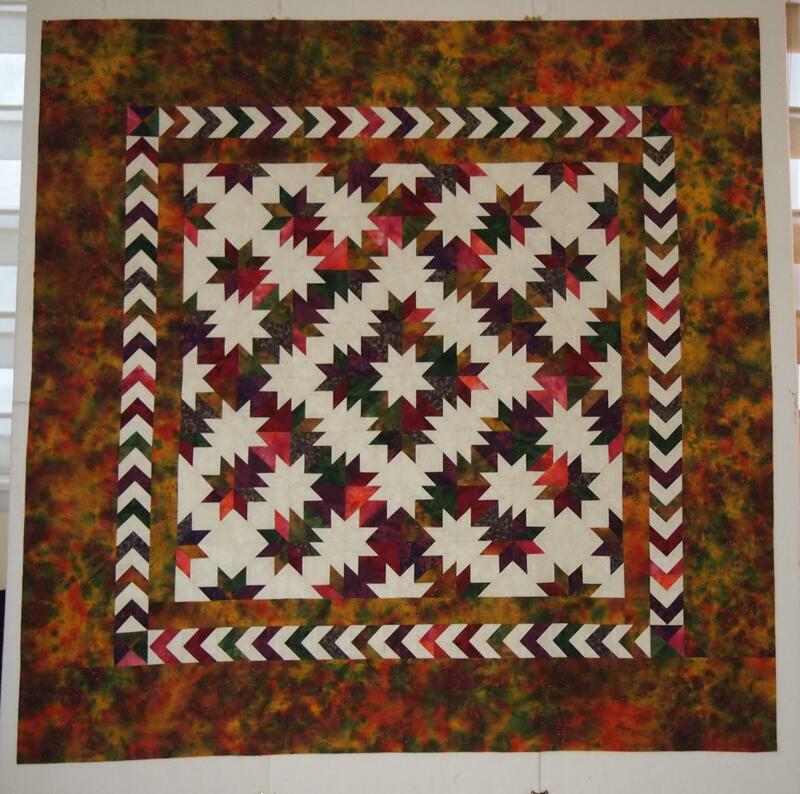 This quilt measure 68″ by 68″. SueNami is an unusual Hunter Star medallion style layout. It was great fun, but I would say it is not for beginners. 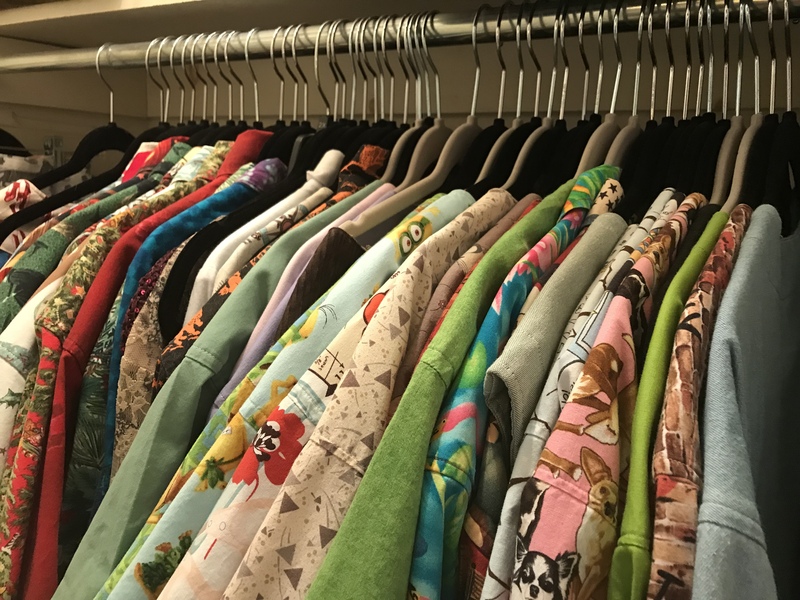 It’s not difficult, but you must use your best organizational skills. The inner border is made from Flying Geese blocks. A flying goose with a large light triangle always follows a flying goose with a large dark triangle. Each large triangle is the same color as the small triangles of the goose following. By doing that, the seam line disappears and it fools the eye into seeing chevrons. We go to the design wall with triangles so we can arrange them with a good balance of colors. 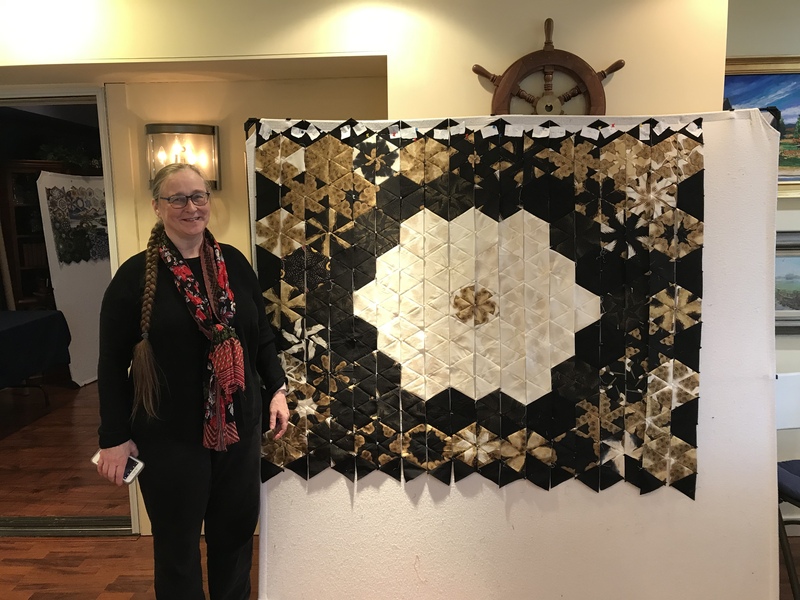 When you are pleased with the layout, you take down 2 triangles at a time and sew them into a square and put them back on the design wall so as not to mess up your design. 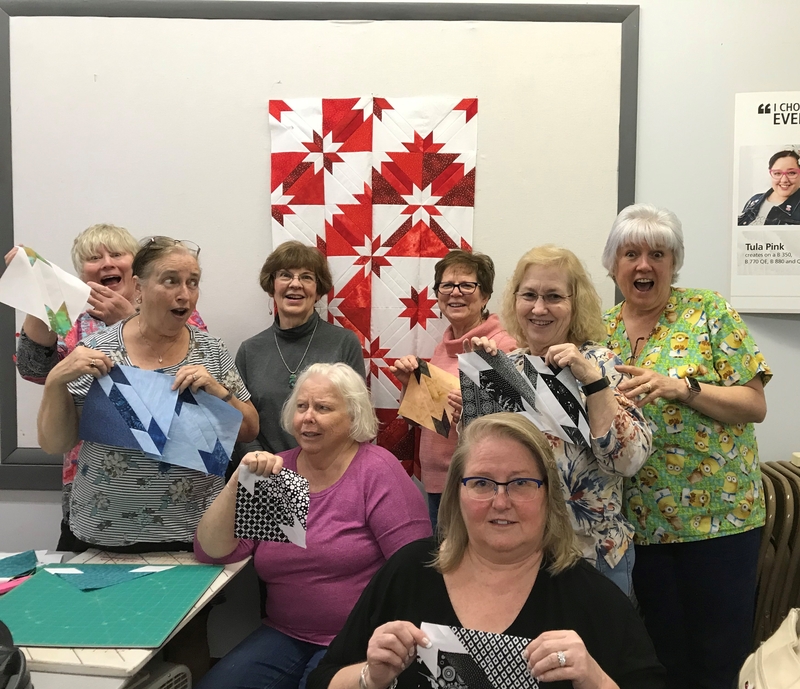 when all the triangles are sewn into squares and back on the design wall, you begin again to take them down one at a time and square each one up and place back on the design wall. 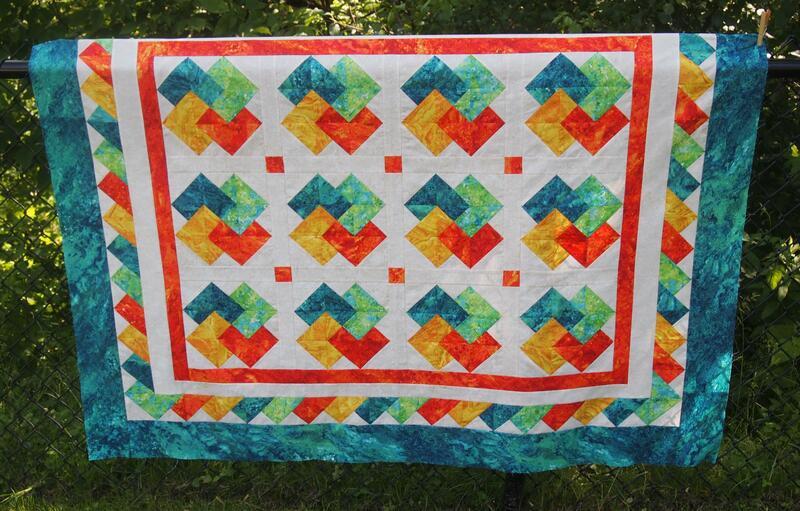 when everyone is square you can sew the blocks into rows and then join the rows. 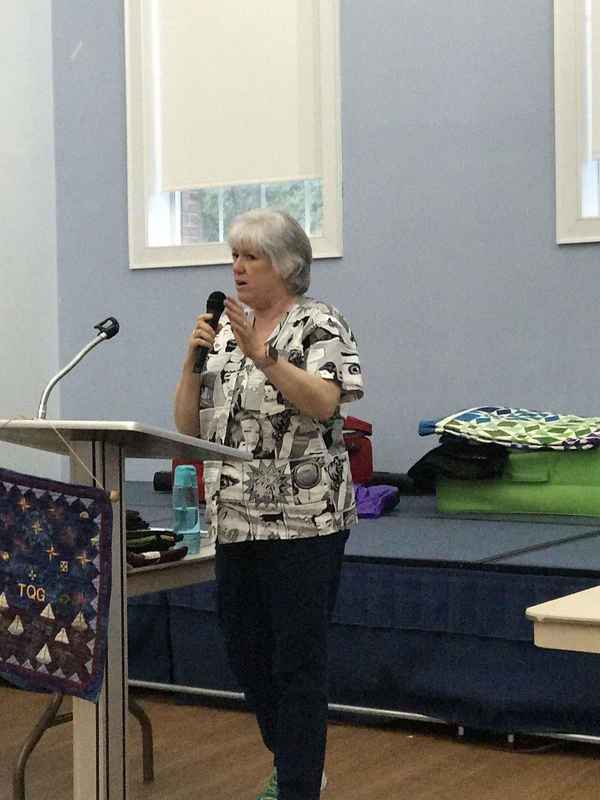 If you don’t have a design wall, a 60″ by 60″ flannel back table cloth will do. That way if you need to put it away you can pin the blocks onto the table cloth and roll it up so you don’t mess up your design. 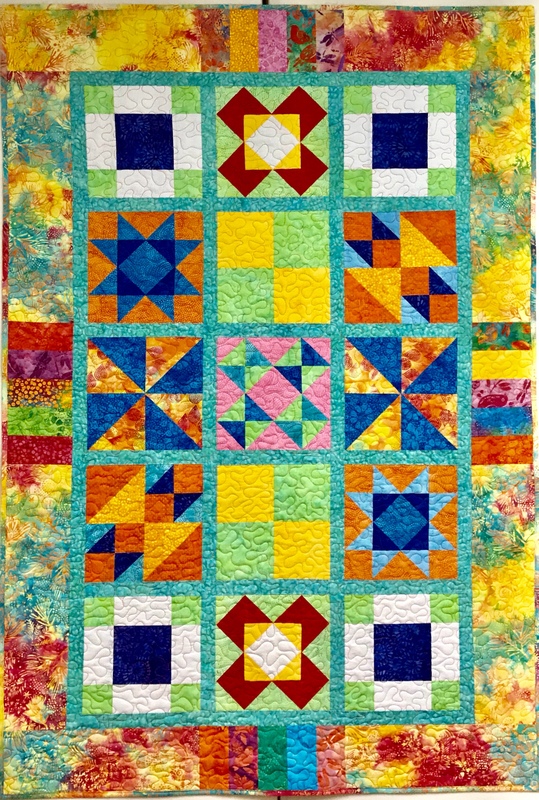 This entry was posted in Hunter Star and tagged Deb Tucker, Hunter Star Petite, quilting, Quilts, Studio 180 Designs, SueNami on November 3, 2013 by ifthesethreadscouldtalk.